Nikki, Vin and I had a great time last night at Mogwai. The film adaptation of my play was the main event, but seeing old friends and sharing food and wine added to my enjoyment of the evening. Direk Rico Gutierrez immediately plied us with baked tahong and red wine and we ordered variations on rumaki (while my companions blissed out on Molten Chocolate Cake). I was happy to see Francis and Andoy and Augie (nasaan ka Earl? ), as well as other friends old and new. In particular, I was happy to meet Eon who came with a couple of my books. The film is called "Room 180" because of Direk Rico's decision to deploy proscenium stage techniques, permitting the camera only a 180 degree angle, which was quite effective. The actors peformed very well, and for the first time in a long time, I felt bad for Danny at the end. This got me to thinking about the difference between theater and film. Staged, the play is supposed to feel more "real". 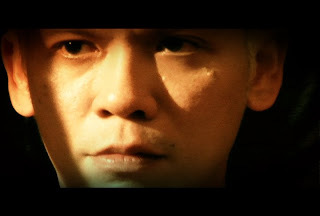 But Direk Rico's treatment, complete with Chekovian pause and extreme close up, affected me more. I don't know if this is because I watch more films now than plays; or because of the ability of film to bring me so close to the actors (the limitation in plays is that you can only see from where you're sitting and can easily miss delicate nuances of facial expression depending on blocking). I discussed these things with Wanggo and Paulo after the show as I tried to articulate this oddness. In a way, I feel disassociated with my text. Of course it's familiar, I did write it after all (and much kudos to the excellent screenplay of Augie! ), but that was way back in 1990. I was talking to Nikki and Vin as to why this play retains the interest of various people because I couldn't understand why (because, perhaps, I know it inside out). But interestingly enough, I was riveted by the film treatment, because it was so... different and more intimate. Mogwai's upstairs theater was also a welcome surprise. We were asked to remove our shoes before entering the intimate carpeted viewing room strewn with cushions and pillows of various sizes - which made for quite the organic "sit-in" feeling. Thanks again to Rico, Augie, Francis, Andoy and Earl for a lovely film and a wonderful evening.